It has been a long two weeks since I wrote a post and boy have I missed it. I’ve been grumpy and tired and wondering what was wrong. Now I realise it is because I have not blogged or cooked properly in ages. Now sitting here, writing this, I feel a little more like me again. I’m taking my mind off work and slowly back into thinking and dreaming of food all the time. We have had a few very nice distractions to keep me away these two weeks. We were away in Connemara for our anniversary and we got a puppy!!! An eight week old golden lab called Cara. We are totally smitten and are dividing our time between cat and dog cuddles. I wake up in the mornings, go to work and cannot wait to get home so I can cook (and play with Cara and Lawrence of course). This year has in some ways flown by and in other ways it feels like it is never ending. So much has happened in this little year and thankfully it is not over as I have so much more to do in the remainder of it. This has been a year of repeats. 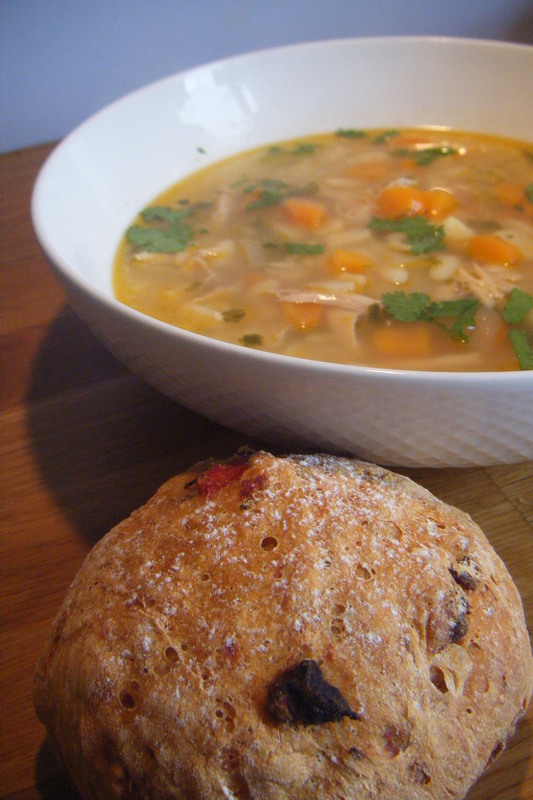 We have had many servings of my meatballs, lots of beef stews, pizza, baked fish, salads and steaks but there has been a LOT of my tomato,red onion and fennel bread and chicken noodle soup to go with it. These are the two things that I have made for my father on a VERY regular basis. Today my father made this soup for the first time by himself, in an attempt to learn to make it while he spends winter in his home in Greece. Like Ireland, Greece has wet and cold winters and there is something so warm and comforting about soup, especially this one. His first soup making experience went very well indeed. I am most proud and glad not to have had to make dinner tonight! For as long as I can remember, chicken noodle soup has been the one thing that has always made everything ok. When ever I’m feeling sick or blue I make this soup. I used to have an addiction to the packet chicken noodle soup (I actually have one in the cupboard for emergencies) but now I make my own. 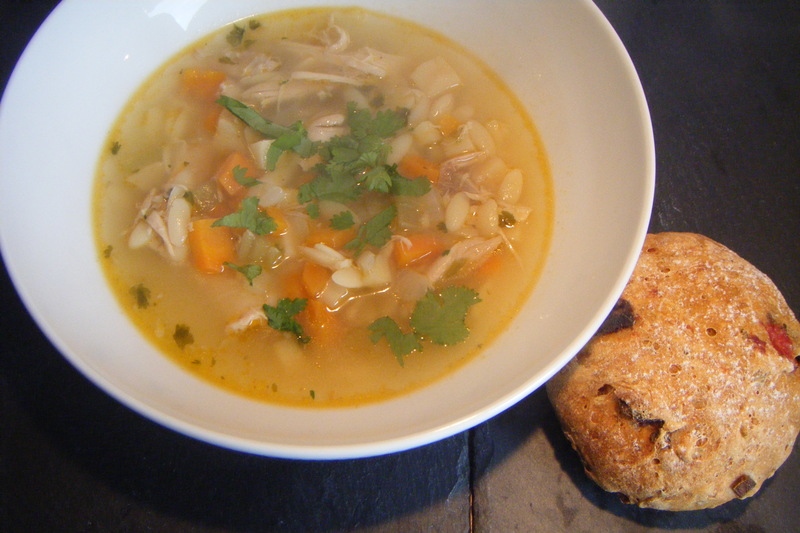 There are so many ways to make this soup and you can use a range of different pastas or noodles but this is the soup that I have made almost every week since January 2013. When my father fell sick earlier this year, all he wanted at the beginning was chicken noodle soup. But when it comes to my father, everything has to be homemade and with no salt. So I put together this recipe and he has asked for it every time he stays with us. It is a bonus that we (D and I) absolutely adore this soup too. I make it in big batches, half of which is eaten straight away and half I freeze in individual portions. My recipe calls for good quality chicken stock. Now I make my own salt free stock, which when I next make it, I will take photographs and post it. But for anyone trying this, you can use a good quality chicken stock cube or fresh shop bought stock. My advice to you is to make this when you have left over chicken (from a roast or just cooked chicken legs) in the fridge. Otherwise you have to go through the hassle of cooking up some chicken to put into it. 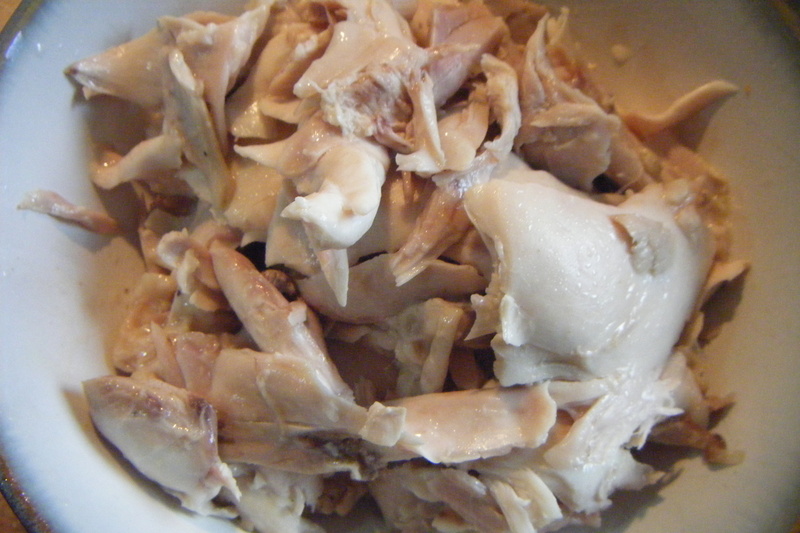 I like to use the darker meat from chicken legs as it is that little bit more tasty. 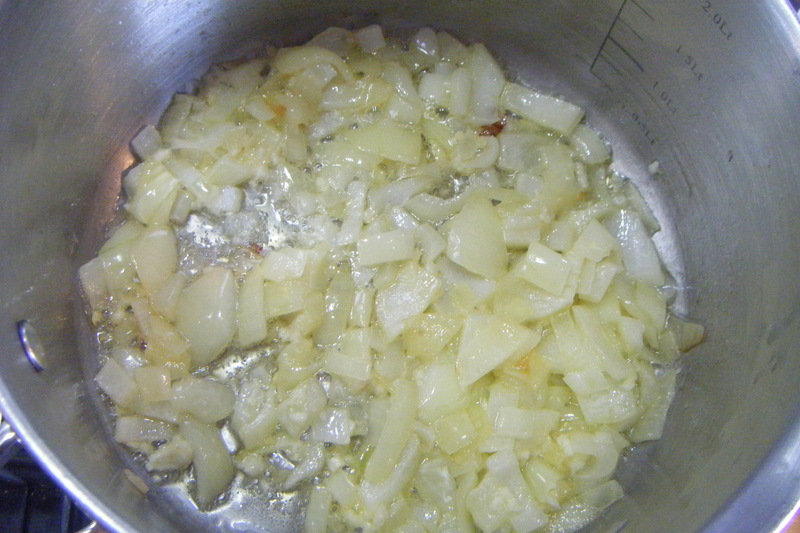 Fry the onion in a large saucepan for 2 minutes to soften. Add the garlic and stir. 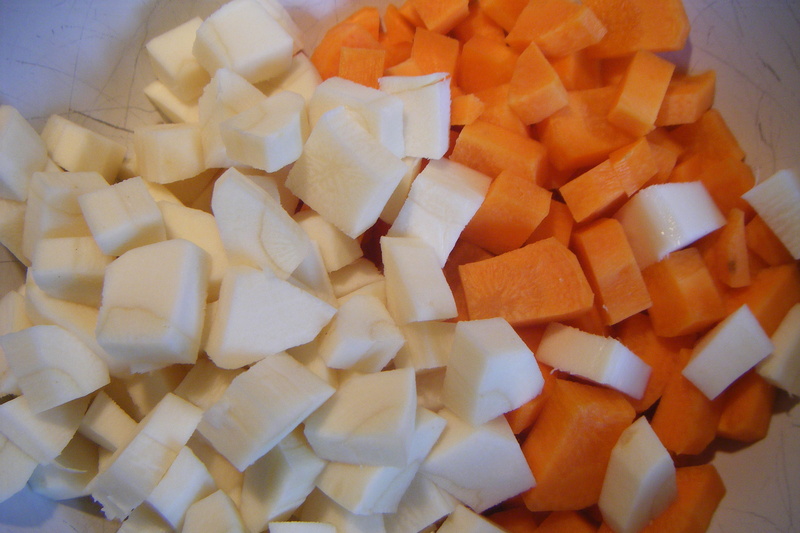 Add the chopped carrot, parsnip and celery and cook on a low heat for 5-10 minutes. 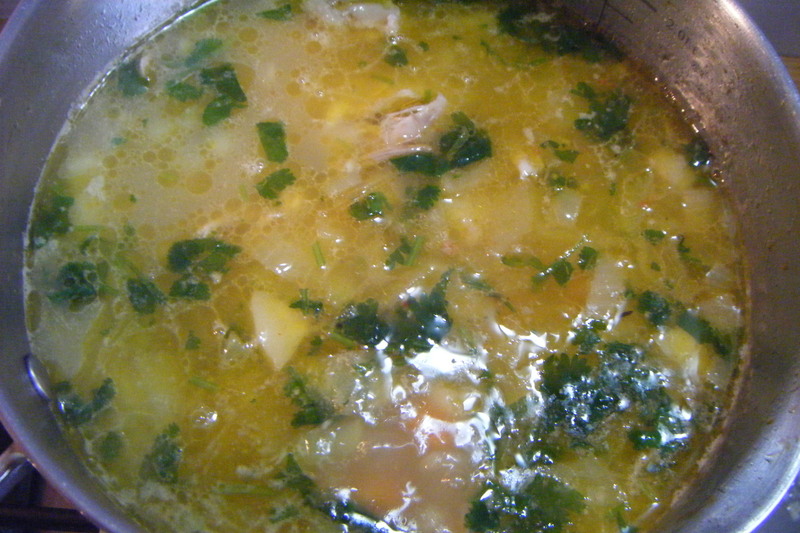 Add the chicken stock, chicken pieces and half the coriander, dried herbs and fresh pepper. And simmer for 10 minutes. Throw in the pasta and simmer for a further 15 minutes. Stir every few minutes or the pasta can stick to the base of the pan. You may need to add a little more stock or water along the way as pasta soaks it up rather quickly. Once the pasta is cooked, then ladle into bowls, sprinkle with remaining coriander and tuck in. I serve mine with warm tomato, red onion and fennel seed rolls. Well not quite, but thank you! Oh and I loved your flourless chocolate cake/pots.